As a kid I actually really wanted to be a fashion designer, and would fill up scrapbooks with drawings of clothes that I wished would exist. For example, one outfit that I invented when I was about 9, that I would totally wear now, is a hooded white velvet minidress with a long zip up the front and hot pink feathers around the edge of the hood. Honestly, like, someone please make me that immediately for a casual daytime look. Somehow fashion design morphed into recipe design, but I still love clothes so, so, so much, and approach them much the same way in which I do food – with my mind on texture and bringing together slightly strange elements with more recognisable and familiar things. Not much makes me happier than fossicking through op shops and vintage shops, allowing time to dissolve like a sachet of colourfree raspberry flavoured Raro juice in a jug of water as I try on garment after garment and imagine how I can incorporate them into my daily costumes. However! I can talk myself out of buying clothes, no matter how much I need them, like, my shoes will be held together with superglue and have the holes in the soles buffered with beer coasters and I will still be all “uhhhh I probably shouldn’t spend money on these new, excellent value, durable, good-looking replacement shoes, I will just hobble around in these travesties for another year.” When it comes to food though, I go into a damn trance. Just two days ago I went in to the supermarket to get cocoa and buckwheat flour and walked out of the supermarket with a jar of raw organic probiotic sauerkraut (which is, thankfully, SO delicious.) I absentmindedly meandered into Commonsense Organics the other day and came out with seven whole turmeric roots. 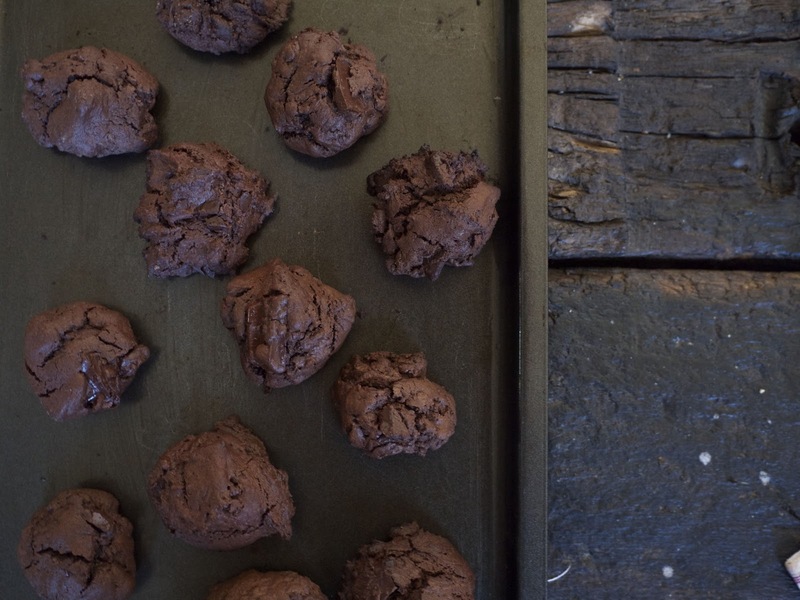 I’m kind of not really going anywhere with this – it’s just that the reason I was going to buy cocoa and buckwheat flour was because I was going to make the cookies that you see here, and it got me thinking about myself because that’s all I think about, apparently. These cookies though! I was recently given a copy of Simply Nigella, the new cookbook by my idol Nigella Lawson. I want to make pretty much everything in it but this recipe caught my eye with the inarguable motivating factor of, if I make them then I will have cookies. It also seemed like a nice thing to be able to tell my newish roommate that there are cookies on the bench and they can help themselves to as many as they want – I just like being that person! 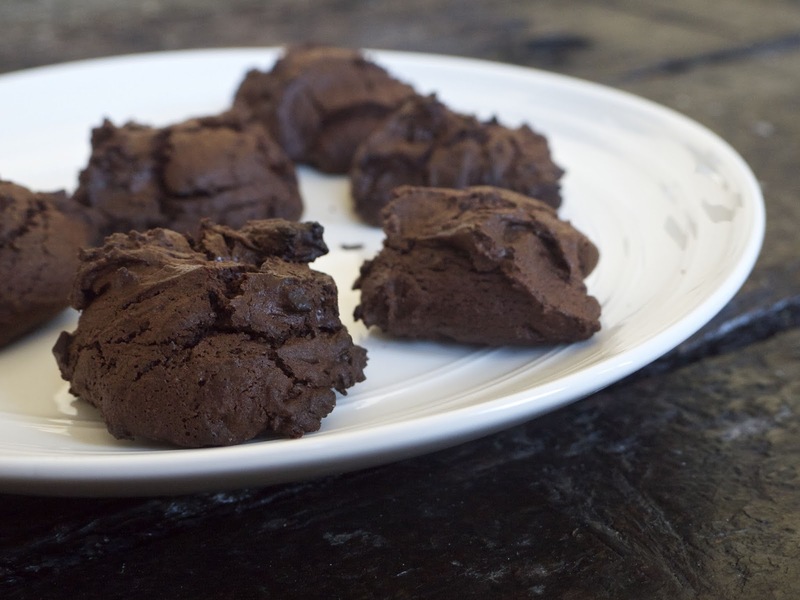 The buckwheat flour in these cookies makes them gluten-free, which might be pleasing news to some of you, and also gives it a rather fascinating smoky tone echoed in the rich cocoa and almost throat-burningly dark chocolate. They’re all cakey and melting and punctuated with chunks of chocolate. 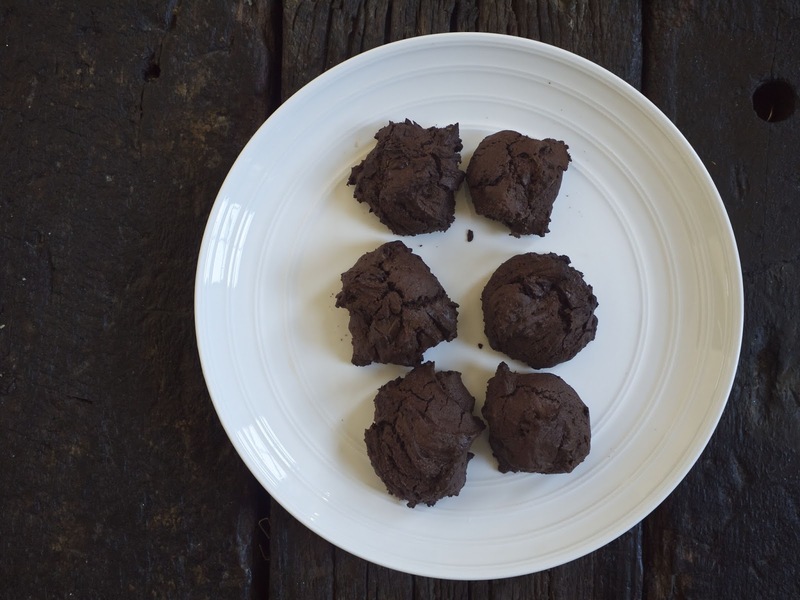 They look like lumps of coal and are altogether highly compelling wee things; you could make them with regular flour which would make them taste more normal but I like the oddly addictive husky flavour the buckwheat gives. I am lacking in measuring scales and so had to estimate the quantities in cup measures; thus I have written out here the recipe I made since this is the one that worked for me. I accidentally got white sugar instead of the brown sugar requested in her recipe, because my reading comprehension is useless – I’m very sure they’d be even nicer with it though. from Simply Nigella, altered slightly to accommodate for things like cup measures and the fact that a block of chocolate here is 250g and I couldn’t be bothered buying an extra 20g chocolate to make up her specified quantities. Beat the butter and sugar together with a wooden spoon or whatever, until it’s quite light and fluffy. Briskly beat in the melted chocolate – make sure you let it sit for a minute or two so it’s not boiling hot before you tip it in – and then beat in the eggs quickly. It will look far too liquid at this point but stir in the flour, cocoa, baking soda and finally the remaining chocolate bits and it will suddenly turn into a thick cookie dough. 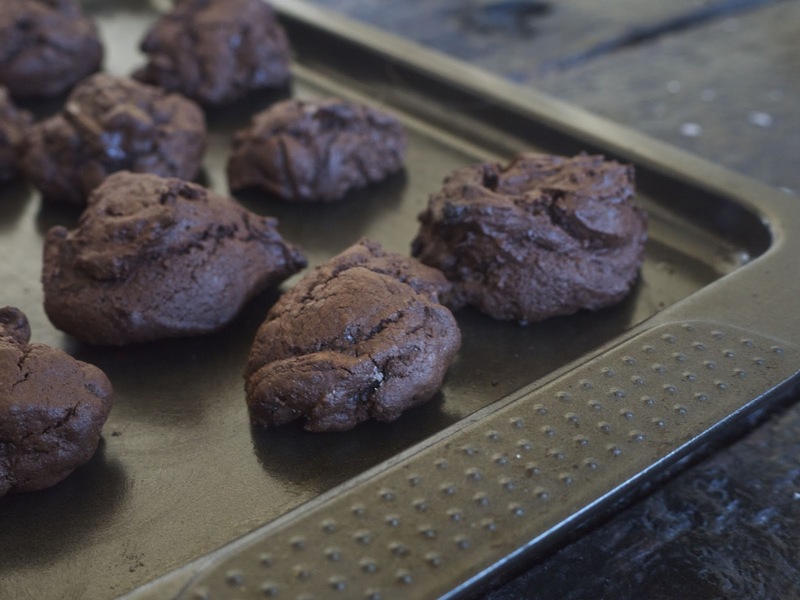 Take heaped spoonfuls of the dough and drop them onto the baking tray – Nigella suggests leaving 6cm space between them but they don’t spread that much – and bake for 8-10 minutes. Remove them from the oven and leave them to sit on the tray for five minutes before carefully transferring them to a plate or rack, then repeat with the remaining dough, which you should put in the fridge while you’re waiting for each batch to cook. These are so good! I’ve had one in my mouth pretty much the entire time that I’ve been typing this (that is, I’ve eaten several in quick succession, it wasn’t just one cookie) and couldn’t be happier about it. For once I got as many cookies out of the batch as the recipe promised, as the raw dough is honestly not thaaaaat nice – however the grainy density of the buckwheat becomes entirely delicious once it’s all cooked. 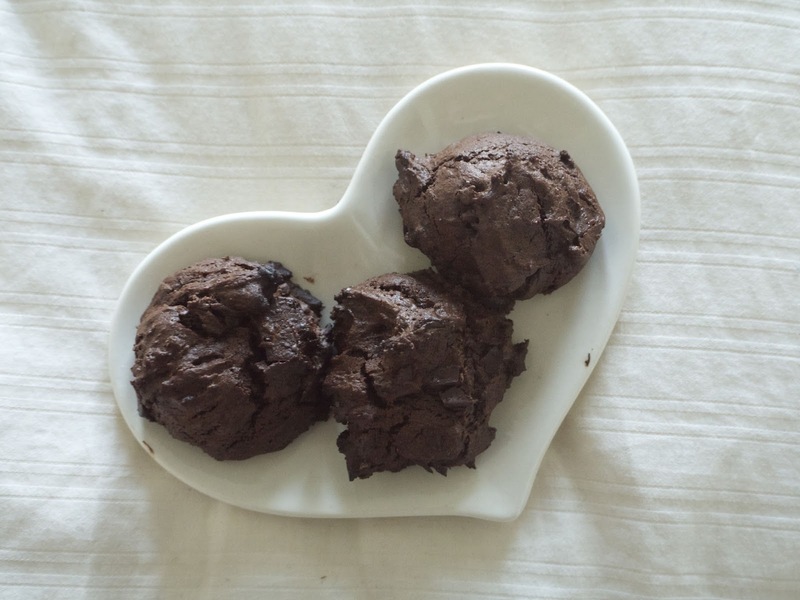 They’re even better the next day, somehow even more melting and more chocolatey. All I’ve done lately is work so I have little to report but coincidentally I’m feeling moderately financially chill for the first time in living memory (I have the memory of a goldfish though, but also goldfish are incredibly intelligent and their three-second memory is a total myth so…ha! Okay, I got a bit lost here.) I don’t know how I’m doing so okay as my rent is more expensive than it has ever been but I’m trying really hard at budgeting and freelance hustling and so on; I’ve always identified heavily with grubby uselessness-monger Nick Miller from the TV show New Girl, but as the latest season unfolds it’s nice to see we are growing together. “they said avocado is extra and I said shh, I know it’s extra. but I want it.” Nick is I and I are Nick. title from: the siiiiick Lizzo song Batches and Cookies featuring Sophia Eris. Such queens. DZ Deathrays, Blood on My Leather. I spontaneously went to see these guys at Bodega a couple of years ago and they were sooooo good. I love their bratty sound. Rihanna feat Drake, Work. She released a double video for this and they’re both so dreamy and gorgeous. This song just gets better with every listen: praise Rih. Stereo Total, I Love You, Ono it starts off disguised as an irritating song but suddenly the more you listen the more it gets stupidly endearing. next time: maybe something more from Simply Nigella, this book is a stunnerrrrrr. Hi. Your cookies looks delicious! Can't wait to baked it on this coming weekend!